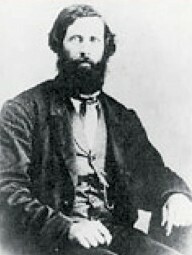 Dr. Brewster Higley 6th, MD was born November 23, 1823 at Rutland, Ohio. He lived his early life with his Grandfather and later his sister due to the early death of his parents. He began his study of medicine in New Plymouth, OH at the age of 18; his first practice being in Pomeroy, OH. In 1848 he moved to LaPorte, IN where he continued his medical studies, graduating and receiving his medical degree in 1849. He practiced medicine in LaPorte and surrounding communities until the spring of 1871 when he headed west to homestead his 1/4 section in Pleasant Township, Smith County, Kansas. He lived in a dugout with friends in Gaylord, KS during the winter of 1871. On the 4th of July in 1872, with the help of friends, neighbors, good food and plenty of cold beer Dr. Higley completed the construction of his Cabin on the site where it still stands today. Dr. Higley was an intelligent surgeon of good repute and a true romantic. His personal life was one of great joy and tremendous tragedies. Being a romantic he loved female companionship evidenced by his being married five times. Death dealt him a heavy blow in his first three marriages with all three wives dying prematurely. Dr. Higley never gave a specific reason for wanting to go to Kansas; competition in the medical field may have contributed but historically it is believed an unhappy home life was a major reason. After his divorce by default in February 1875 from his wife Mercy A. Higley, he married Sara E. Clemans on March 8, 1875. This union lasted until Sara's death in 1911 in Shawnee, Oklahoma. Dr. Higley died 4 months later, saying his home was like a tomb without his beloved Sara. Dr. Higley and family lived in the Cabin until the early 1880's when they moved to Smith Center. In 1886 he sold the homestead moving to Van Buren, Arkansas, and then to Shawnee, OK where he built a new home. He lived out his days in Shawnee and is buried there in Fairview Cemetery. A quote from his son-in-law, Ed Brumley, probably gives us the best description of Dr. Higley's intelligence and insight to the future when, in 1908 or 1909 he said to Mr. Brumley "A world war will break out in 1914 and if you live to be 60 you will see the sky filled with airships and the highways crowded with vehicles".